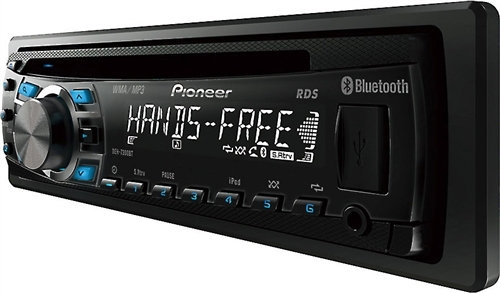 Pioneer designed the DEH-7300BT CD receiver for all you iPod® fans who also want hands-free calling. When a call comes in, this Pioneer will mute the music and allow you to take the call on your compatible phone without taking your hands off the wheel — an important safety advantage on your busy commute. Plug your iPod into the USB input, and you can use the Pioneer's controls to run the show. Once connected, the receiver bypasses your iPod's built-in digital-to-analog converter, using its own high-quality DAC to deliver your music files with the highest fidelity possible. The DEH-7300BT plays all your CDs, including those with MP3 and WMA files burned onto them. You can use the handy front-panel USB input for thumb drives packed with music files, and you'll see song titles and other info clearly displayed in bright white characters on the high-definition OEL screen. 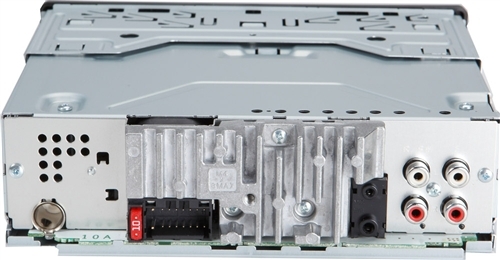 The front panel auxiliary input is handy for plugging in a satellite radio, gaming device, or another audio source. Pioneer's Easy EQ 3-band equalizer gives you excellent control over the receiver's sound. The Advanced Sound Retriever is tailored specifically for your audio files, reversing the compression process to give you more high-freqency sparkle and musical detail. The built-in amplifier delivers plenty of power for good, clean sound. The two sets of preamp outputs offer a convenient connection to a full system with external amplifiers, speakers, and subs. You'll find the low-pass filter and level control on the subwoofer preamp outputs handy for adjusting the bass from the driver's seat. Note: Bluetooth compatibility with this receiver may vary, depending on your phone and service provider.